Spring / Summer ’19 collection is a continuation of the deconstructive patterns, geometrical shapes and signature cuts that made Autumn / Winter ’18 a success. SS ’19 will explore premium fabrics from Ireland and will continue with our Made in Ireland push. Visual Mirroring is achieved as a follow up of an idea we started doing with one pair of denim trousers in AW18. 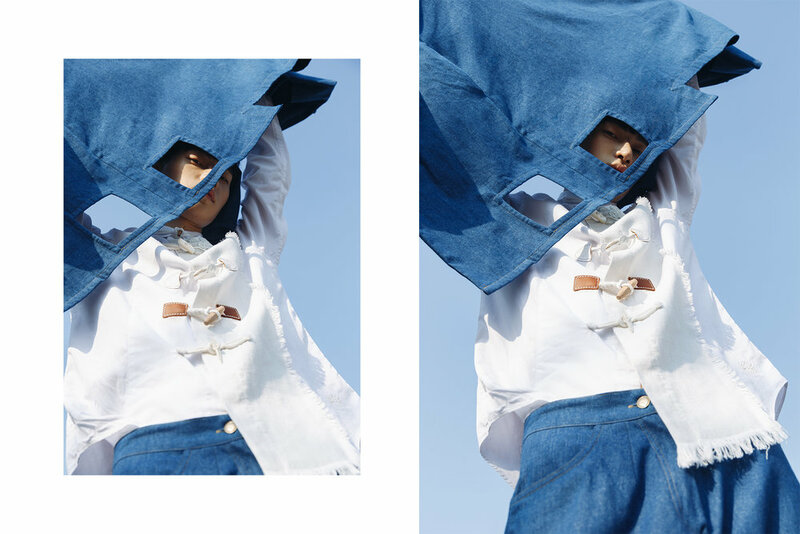 In SS19 we have achieved a much more visually impactful execution of this idea through the 3 piece Denim set of: Reversed Vest, Waist-banded Collar Shirt, and 4 cut flare jeans. Also within the theme, we have visually mirrored the bottom half of dungarees and made every single pocket and zip as a useful function in order to duplicate its functionality versus a classic pair of dungarees. Suit Shaping and the Sexualization of Male Hips is executed in the two suits we have designed for two separate ideas both emphasizing on male torso stomach/hip areas. Houndstooth Suit accentuates the customer's abdominal area while the shorts give a relaxed finish and creates a gap from top to bottom. The structured suit shape is created with some boning which allows the suiting to flare out at the waist/hips while the trousers create a beautiful voluptuous shape in order to achieve a wider shaped hip finish. 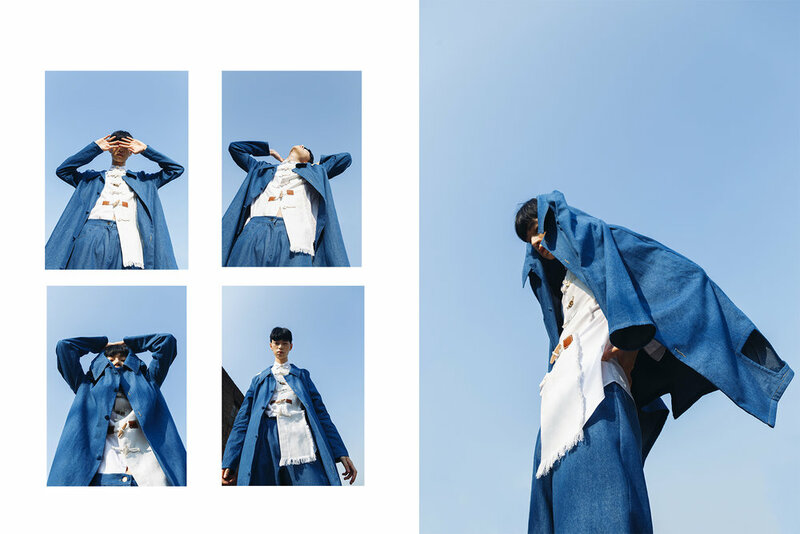 Emptiness as a theme is a continuation from AW18 where we used geometrical cuts at the shoulder (as the male shoulder is an underestimated and “under sexualized” aspect of the male body. We decided to replicate the coat from AW18 in light denim in order to create a cohesive denim collection. The completely empty wool coat frontal with a filled in back from a 100% Wool Boucle was designed a talking piece in order to push forward a potentially more extreme destroying of a perfectly functioning coat into its purest form and functional ability. Lastly, the double-breasted coat and leather jacket were created as more finalized look pieces that have smaller details which separate its functionality in everyday wear for men (such as the leather jackets zippers which function as a pocket when zipped down or expose the lining beneath when zipped up.